The galaxy is bursting with opportunities for savvy space traders to exploit, and the race to profit blasts off in Merchant of Venus. Discover new alien cultures and learn where you can get rich selling their goods in this board game of interstellar trade and exploration for 1-4 players. From your First Contact with alien cultures to the establishment of trade routes and spaceports, your quest for cash demands you keep on the move. Successful traders will quickly locate fast and reliable trade routes, timing their purchases and sales with the interest in the market. 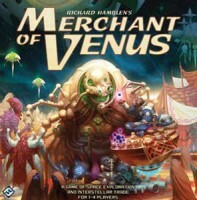 Add a Review for "Merchant of Venus"